The Cambodian capital city of Phnom Penh is in the heartland of the country and situated at the confluence of three rivers. The setting is riverine with most major attractions near the banks. The city has two distinct seasons, namely the dry period from May through to October, and the rainy period from November to April when monsoons can cause the rivers to spill over. The cultural treasures of one of Asia’s largely undiscovered gems include the Royal Palace with gleaming spires, the Silver Pagoda, and open markets that are perfect for local art and souvenirs. The French colonial period added mansions and tree-lined boulevards to the mix. Behind this exotic façade lies a bustling city rapidly emerging from the past. A million leisure visitors come to Phnom Penh every year, attracted by a stable democracy that serves the needs of one of the world’s youngest populations. The city is going places with new restaurants and hotels opening regularly. These add to a hospitality mix that includes international discos side-by-side with sidewalk noodle shops, and traditional neighborhood pubs. Phnom Penh’s central location makes it the perfect springboard for a visit to romantic Kampot or the adjacent Bokor National Park (also known as Preah Monivong National Park) featuring the ruins of a historic colonial retreat. Other fascinations include warm sandy beaches at Sihanoukville, and the achingly lovely Angkor Wat temple complex near Siem Reap. The open-market Cambodian economy has made rapid progress during the past ten years, with per capita income increasing and textile and tourist trade ramping up. This has caused the emergence of a prosperous middle class. These new Cambodians aspire to quality education, health care and access to the consumer goods they see on international television channels. Phnom Penh’s academic institutions are responding to the challenge to produce an abundance of world-class medical and dental care providers. The venerable Royal University of Phnom Penh has 18,000 students, and 294 academic staff who offer programs in major disciplines including dentistry and medicine generally. Modern developments ensure easy access to the City. Phnom Penh International Airport (PNH) handled well over two million passenger movements in 2013, and 26,000 aircraft movements including air freight. It is served by all of Asia’s long-haul carriers, and most European, Middle Eastern, and American carriers who either deliver directly or via codeshare. The airport’s impressive service levels are complemented by connecting flights to all major Cambodian destinations. Within the urban area, a network of bus companies compete with taxis, minibuses and pickups to deliver arriving visitors to their destinations. 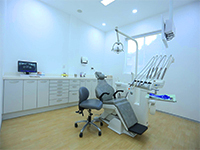 Dental Travel Services are premier facilitators of high quality, overseas dental tourism experiences for Australians, North Americans, and Europeans. 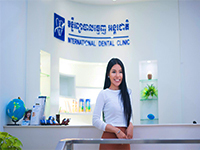 We are your local dental contact from when you arrive in Phnom Penh until you leave with some regret. We can help you save up to 80% on high end treatments on the cross rates, without any compromise on quality.